So my life is in transition. It's definitely unsettling, I think I'm having minor symptoms of a depression. Today I met with Azukar Organics' investment broker, David Royal, to hear learn about our Private Placement Memorandum. Then I met with Celia afterwards for lunch. I finally got it off my chest that Rick Fisher gave me an ultimatum, and I needed Celia to assure me that I would be taken care of. And she did. She said to be honest to Rick, that way no matter what happens, my conscience will be free and clear of any deception. I guess, I planted the seeds for this situation to happen, and so I do have some peace about what could happen. I came home about 4:45PM and got right into bed and fell asleep. I woke up at 6:18 and every fiber inside of me didn't want to go to Crossfit. But I did. And I'm glad. I immediately told Dave that I'm in bad space and was unsure if I could do all of the rounds, and I wasn't too confident that I could run the 400 meters in 4 minutes. Dave told me to just try, even if my run spilled into the next round, so be it. The first run wasn't so bad. I came back and did half the wall balls I did in the first round. Then the runs started to blur together. I know that I came back with 20 seconds rest the first 3 rounds, then 30 seconds of rest the 4th round, and finally 44 seconds of "rest." Can I just be amazed that I ran a mile and a quarter? Seriously, I hate running, it's my fitness weak link. And I did it! I'm very proud of me. I've been conquering/defeating any doubts I may have had about ME, me deciding I can't do the WOD before I even try. Soon enough, I'll have to admit that I CAN. 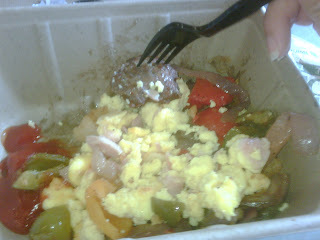 This yummy concoction is ham scramble with bell peppers and caramelized onions, with 2 pc of turkey basil sausage. Lunch: Fried Smelts with lemon, 4oz Gigande beans in tomato sauce and wine, 2 bites of Loukanico. Maybe I'll eat my leftover veggie plate from the Greek place.